So 6 of 11 players returned a goal or assist which is good (minimum 4), 3 of which were double figure returns although as Hazard wasn’t my captain this would have been a negative result. 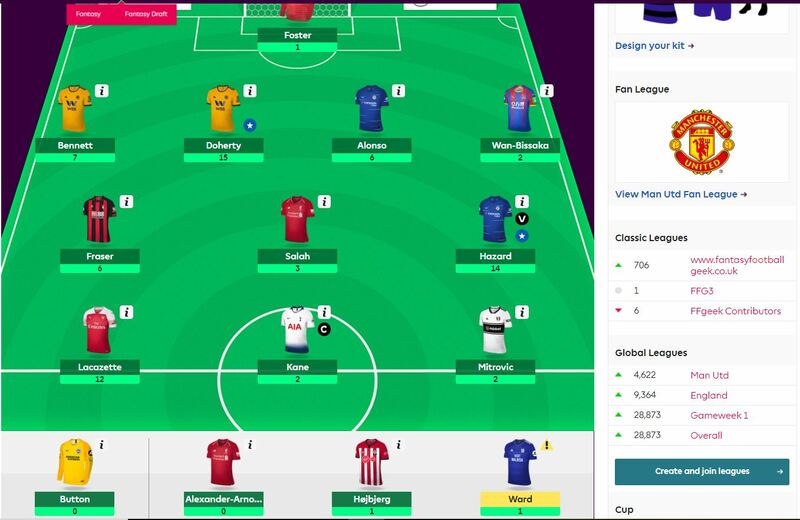 A gameweek rank under the target of 1 million with 611k and a green arrow of 12k. On the surface a good week with all the main boxes ticked of players returning, gameweek rank and a green arrow. In reality though it hides the decision of using 2 transfers for Kane was ultimately was the wrong one. The gameweek in reality was saved by Lacazette and Doherty. There’s no doubt the rolling of the dice for Kane in was a disaster resulting in snake eyes or 2 1’s for those not familiar with the term. So to relive it, the Mendy fit news threw me on Friday but I was too emotionally invested in having Kane as I had no real transfer needs in my team up to the Friday afternoon Mendy news. The Hazard debacle of a few weeks ago was fresh in my mind and the fact that the 3 top 6 teams that played Cardiff all scored 3 goals and more meant I just struggled to walk away from it. The Kane performance statistically wasn’t that bad. 6 shots and a 0.38 xG isn’t a disaster. However, I think against Cardiff he would have been looking for an xG double that but still they aren’t stats that are the end of the world. What was disturbing is the fact that he wasn’t a CF he was a CAM. This has been evident previously but was really brought to the fore in this game. Moura was effectively the CF and surprise surprise he ended up with 5 shots and an xG of 0.93. How this is happening I don’t know. How Kane isn’t a CF is beyond me. Now I’m in a position where I have to clean up the Mendy shaped mess I’ve walked into, that I conveniently buried my head in the sand over on Friday. Mendy at home to Burnley is a double figure accident waiting to happen. Getting Aguero back though has to be the priority as he is a hat trick waiting to happen even with his minutes issues. I haven’t decided yet how to deal with the situation apart from getting Aguero back for Kane. Apart from Kane to Aguero, only 2 players on the outlist. That is the £4.5m mid Ward who was on the bench again and then got himself injured when he came on. I haven’t seen any injury news but he is on the outlist when I get the chance. I do want Mendy back and Bennett is probably my choice to go rather than Wan Bissaka. The double Wolves thing is an option but it’s very all or nothing. The Watford defence conceding 4 to Bournemouth wasn’t a great moment but in reality it was an 10 shot game from Bournemouth with Watford having 10 men so still something that is a monitor rather than a desperate need to get out. Foster was terrible though and I wouldn’t be totally shocked if he was dropped. That would be a huge pain with no reserve GK. The tricky thing is though that Lacazette is the only funding option I have. He didn’t help my plans to sell him with his performance against Fulham. As an aside, the game did show the folly of Aubameyang as a LW and being on the bench. I really don’t understand the new manager. Just seems to want to play all his attacking players out of position apart from Lacazette. So the transfer I will do is Kane to Aguero. I will leave it to the end of the International break. I’m not fussed over price changes. I’ll leave it to then. Mendy is the other issue. I could do Alonso to Mendy for a minus 4 but that feels like robbing Peter to pay Paul and not solving anything. I think I will just have to take the pain and leave him until I have 2 transfers in GW11. At least they play Spurs in GW10 which limits that clean sheet risk somewhat. That works well for Lacazette as Arsenal play Liverpool in that gameweek. It’s impossible to play FPL without spending some games behind the sofa. You just have to hope you pick the right ones to do it. Something I haven’t managed so far. No lineup issues this week. Wan Bisska to the bench away to Everton is the easy call. Aguero or Salah look the obvious calls this week with Hazard playing Man Utd. Even with United’s defensive troubles I think Mourinho will target Hazard to neutralise him. I’ve got it on Aguero at the moment but it could easily be Salah. I need to have a think about when I put the poll up. I don’t want to put it up too early. The wife and I are going to France from Monday the 15th October to Thursday 18th October inclusive so there won’t be any articles over those 4 days as I’ve made the decision (totally on my own!) not to take the laptop. Friday the 19th normal service will resume. This week and up to Sunday I’ll be doing all the normal articles though. Depending on what happens over those 4 days I’m away some of the articles will need some adjusting if there are injuries etc but I’ll try and clear that up on my return. Ok thanks and hope you had a good gameweek. What are your thoughts about Alexander Arnold being dropped? I would be surprised f he doesn’t come back for the Huddersfield and Cardiff games. He gives alot more going forward. However the teamsheet does give uncertainty to the 2 cheap Liverpool defenders in Gomez and TAA although Id like to think both of them will hold their place. UCL rotation aside of course. Enjoy the hols with the missus geek! Thanks mate. Should be good. Guess I just got lucky having decided against transferring Kane in. Captained Hazard, and the double Wolves defense helped me jump 50k to 36k OR. Eagerly waiting for the stats article to see whether I should be doing Mane to Salah over the break. Thankfully, the extra transfer means I won’t have to take a hit. I know it’s hard to be away, please if at all possible update the latest wildcards, those articles tend to cover so much ground. I believe that would be Andrew Ferguson, Yaniv Solomon, the Imaginary Geek team and Rob Reid (who wild carded last week). 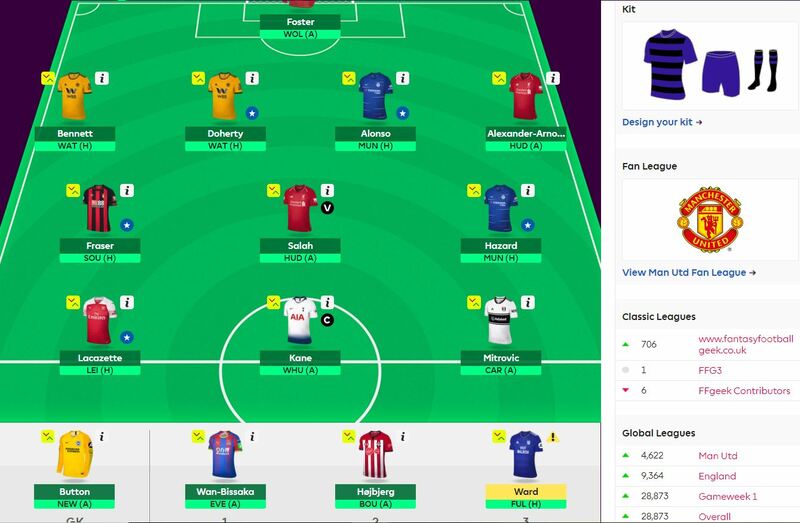 Is it healthy to buy kenedy due to his nice run of fixtures? @Sam – I think he’s worth a punt. But he is only a punt. I’ve gone for Knockaert as he has good underlying stats plus a great run.